Home/Blog/A picture is worth a thousand… frames. A picture is worth a thousand… frames. Because your videos are presented to your followers with just that – a picture! But don’t panic, here in BuzzMyVideos we still strongly believe in the “moving image” and we want to make it even more relevant by making you express your creativity by enriching your thumbnails. Have you ever happened to watch a movie because of its poster? We all make the same split second decision with online video but in this case it’s the thumbnail that draws our eyes and compels us to click. The thumbnail is a videos’ strongest call to action that invites your followers to watch. So the more eye-catching the thumbnail, the more likely it will bring the viewers to your channel or page. As Lev Manovich wrote in his “The Language of New Media”, after the digital revolution, the image acquired the new role of an interface and it works like a portal to a new world. The image on the web completely changed its role as now it works as a representation of the link that the user wants to follow. In the same way the thumbnail is the interface of your video. It has been demonstrated that videos with custom thumbnails perform better on YouTube and Facebook than ones without them and exceptionally compelling thumbnails result in more clicks to views and a higher ranking on YouTube. These are the reasons why we at BuzzMyVideos has launched a new tool called The Thumbnail Editor, exclusive to BuzzMyVideos creators. Now you can easily create your video thumbnails directly in your BuzzMyVideos dashboard. 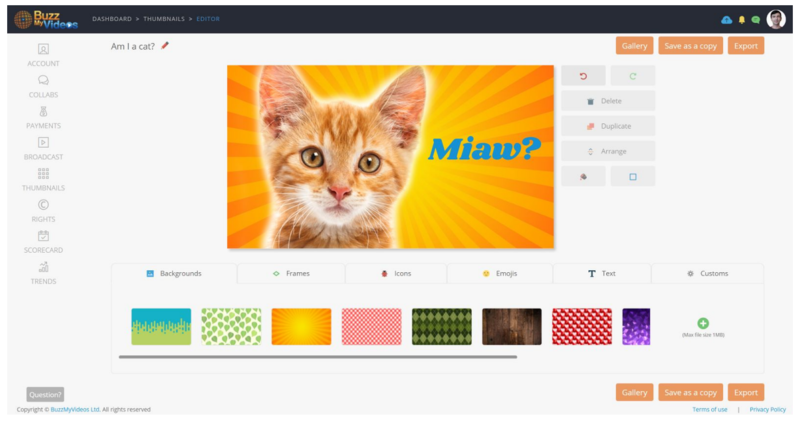 Through this tool you can add icons, emojis, frames, text over a preset background or uploaded custom image. Now it’s your turn. Start creating and let us know what you think via our social media channels as we are planning to add more and more functionalities. We would love to hear your feedback.